Judge Mary Logan presides over the city's new community court. 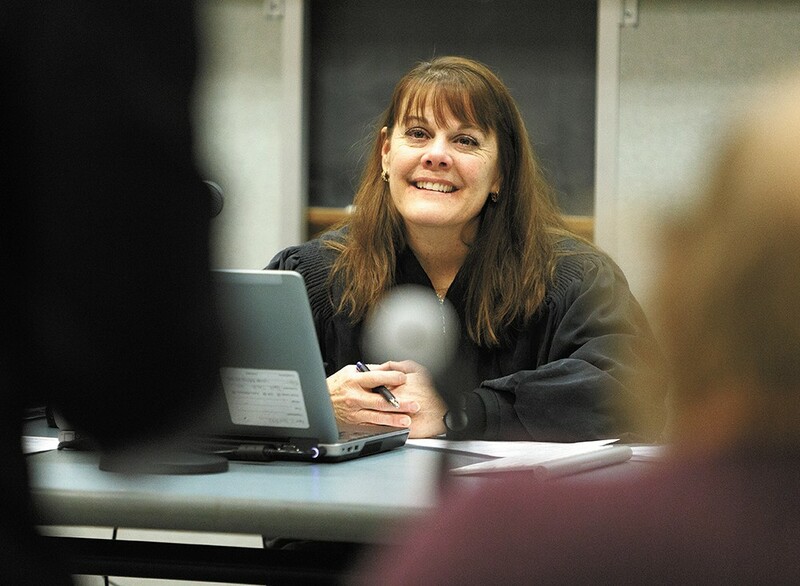 Still in its infancy, Spokane's Community Court is showing early positive results. After eight weeks of court, data is still somewhat premature for the pilot program being led by Municipal Court. But presiding Judge Mary Logan told the city council in a meeting today that the program has seen "incredible enthusiasm." "Have we actually moved the needle on some of the downtown core?" Logan said during today's meeting. "We have made an impact, but I cannot say there's been any percentage difference." Still, the court has seen 115 offenders with as many as 53 people on one docket. Logan has ordered 408 hours of community service, of which 151.2 hours have been completed so far. Considering housing an offender in jail costs about $135 a day and estimating each of the offenders could have spent about 10 days in jail for misdemeanor offenses like trespassing, the cost of traditional sentencing for everyone seen by Community Court would have totaled about $155,250. The community service hours the court has ordered have cost just $3,802, according to the court. That means, assuming every offender would have served time, the system has saved more than $150,000 in just two months. In addition to those seen and sentenced by the court, 50 people with no crimes have accessed the service providers who partner with the court each week. Many types of special courts are known to be effective, but they can take time to show significant reductions in crime because offenders are often dealing with a multitude of issues, like a lack of housing, substance abuse or mental illness, meaning they may be seen several times by the court before their behavior is actually transformed. The Spokane Community Court, which is made of a broad partnership of representatives from municipal court, probation, Spokane Police and others, offers nonviolent offenders community service and access to services instead of jail time. It's part of a growing movement to address root causes of so-called "quality of life" crimes. We wrote about the court, which is aimed at nonviolent offenders who commit crimes downtown, here. Court representatives asked the city council Thursday to help raise public awareness about the court and encourage people not to give money to panhandlers. That's an effort the council has already gotten behind, donating about $7,000 to a $20,000 anti-panhandling public awareness campaign the Downtown Spokane Partnership is expected to launch this spring.